Today was largely a scrappin' day. I dropped Kaitlin off at school and picked her up, prepared lunch and dinner, shoveled the driveway and other than that, I scrapped. Hmmm...only one day out of my nine was devoted to scrapping. That's not too bad, right? Kaitlin made her own little creations right along with me most of the afternoon. She's good at making use of my scraps and I'm sure she's going to be quite to artist someday. I will share one layout with you tonight...I'm sure my brother will love this one!! my brother, lee…definitely the ‘preppy’ of the family. he is now a senior engineering student at sdsu and enjoying his college years…if you know what I mean. no, really, he’s a pretty good kid. called his big sis – too cool for that - so i knew this had to be big). ya know what he said? “i got offered a job at hollister…only good looking, cool people get offered jobs at hollister!” he was so excited about his new job…now officially a ‘hollister boy’. we do give him a hard time quite often, but, ya know…he is kinda cute, i guess…for a little brother anyway. 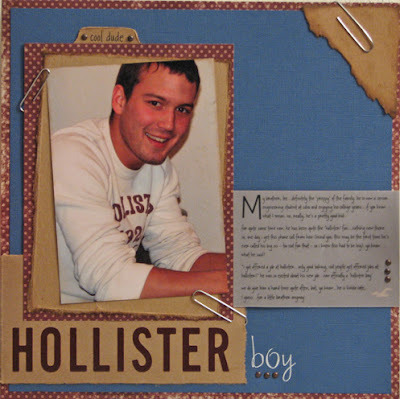 This inspiration for this layout came largely from the Hollister website...the main page has a dusty blue background and there are a lot of chipboard colored elements like the file tab at the top of the main picture and also the paperclips. I've been wanting to do a layout on this ever since I got that call from Lee, but let me tell you, this guy is not a willing model for photos (you'd think he would be beings he's so cute and all)...I had to get this one 'on the sly' on Christmas Eve!